This critically-acclaimed album was recorded in January 2014 with the Orchestra of the Age of Enlightenment and former choral scholar Gerald Finley. It is the first recording of Marc Rigaudière’s new reconstruction of the earliest complete liturgical performance of the Fauré Requiem. It faithfully recreates the 1889 premiere, even using the organ stops available to the organist at the L’église de la Madeleine in Paris. The instruments and techniques used by the orchestra are typical of those used in a French orchestra of the late 19th century. The expanded version of the Requiem, as edited by John Rutter, is also included on this album for comparison. 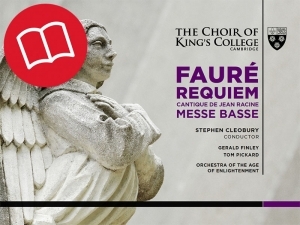 Fauré’s Requiem forms a cornerstone of the Choir’s repertoire, along with the Cantique de Jean Racine, heard here in its original version for Choir and Organ. These works are complimented by Fauré’s Messe Basse for high voices, sung by the sixteen choristers of the Choir. Recorded at 96kHz 24-bit PCM 5.1 surround-sound in the Chapel of King’s College, Cambridge, by kind permission of the Provost and Fellows, 9-14 January 2014.